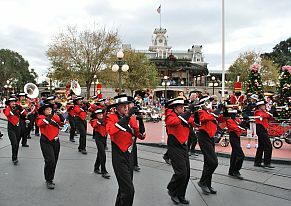 To cap off a fantastic competition season, the George Walton Academy Marching Bulldog Band marched in a parade at Walt Disney World’s Magic Kingdom. My elder daughter, Madeline, is a member of the color guard, and my wife and I traveled down to Florida and watched the band march. It was a wonderful experience. I tried to get some pictures (click the photo below to see them), but they didn’t turn out so well. Fortunately another band dad got some good video of the band (below). Most of the band parents were running along the parade route, taking pictures and video, and when we ran out of sidewalk we just fell in behind the band. In the second video below you’ll see Jennifer and I sharing a laugh with some other parents about plowing our way through the crowd to keep up with the band. I sure hope Disney lets us come back! ‹ It’s Not a DOS Prompt!